From the Atlantic Coast to the Gulf Coast, cities and towns across the Southeast U.S. ring in the New Year with street parties, elegant galas, family-friendly events, and many other celebrations. If you are looking for a fun place to welcome the New Year, here are 10 great Southern cities, each offering an array of New Year's Eve festivities. Enjoy a grand gala celebration at either the Inn on Biltmore Estate (and enjoy the final weekend of Biltmore holiday decorations) or the OmniGrove Park Inn (where the fanciful National Gingerbread House Competition creations will be on display). Downtown and around Asheville find an array of clubs and other venues offering great live music, New Year's Eve dining, and more. Atlanta welcomes the New Year in style with big parties, college football, the annual countdown and Peach Drop, family fun, and more. Visit New Year's Eve in Atlanta to find out about several of the top Atlanta celebrations and events, plus some travel tips to help you plan your New Year's Eve visit. Biloxi loves to party and the hotels and casinos go all out for New Year's Eve, featuring everything from midnight balloon drops to dance parties, party favors, gaming, and a host of other lively parties and midnight celebrations. Welcome the New Year at Charleston's largest annual New Year's Eve party and the only aircraft carrier ball drop on the East Coast, the Yorktown Countdown, or enjoy a gala celebration at the Snyder Grand Ball at the South Carolina Aquarium. Circa 1886 Restaurant celebrates New Year's Eve with a festive six-course prix fixe dinner; or, for an alcohol-free, family-oriented celebration, head to Marion Square for Happy New Year, Charleston!, featuring music, children's activities and more. Ring in the New Year at The Ballantyne Hotel's New Year's Eve Party in the Great Room or celebrate in the hotel's Gallery Restaurant with a New Year's Eve Dinner Packages. For great family-friendly fun, check out First Night Charlotte. Visit our Charlotte City Guide for more New Year's Eve celebrations at clubs and hotels located in and around Charlotte. The famous Peabody Memphis offers a few different New Year's Eve dining and party choices; or, for a street party atmosphere, head to Countdown on Beale, a huge party featuring a midnight guitar drop and New Year's Eve festivities along Memphis' iconic Beale Street. Hearty (or crazy) souls can begin New Year's Eve day with a chilly dip in the Atlantic Ocean at the Ocean Lakes Family Campground Annual Polar Bear Plunge, attracting about 300 (and growing) participants. In the evening, things heat up with an array of parties to ring in the new year. Broadway at the Beach, South Carolina's largest festival entertainment complex, features New Year's Eve In Celebrity Square with music, dancing, champagne toasts, fireworks, balloon drops, confetti cannons and much more. Ripley's Aquarium features an annual New Year's Eve kid's only overnight for kids ages 6 to 12. Choose from the fun New Year's Eve options at Gaylord Opryland Nashville, including parties into the wee hours as well as a family party, plus several overnight hotel packages. Or, head downtown to First and Broadway for Bash on Broadway, a free block party featuring live music, fireworks, and a midnight countdown and Guitar Drop sponsored by Hard Rock Café. Known internationally for its famous Mardi Gras celebrations, New Orleans is recognized as a top city for ringing in the New Year as well. The largest celebration, A NOLA New Year's Eve, takes place at Jackson Square, where the outdoor party includes live entertainment, a midnight countdown complete with a nine-foot-high, black-and-gold fleur de lis drop and dazzling fireworks show over the Mississippi River. 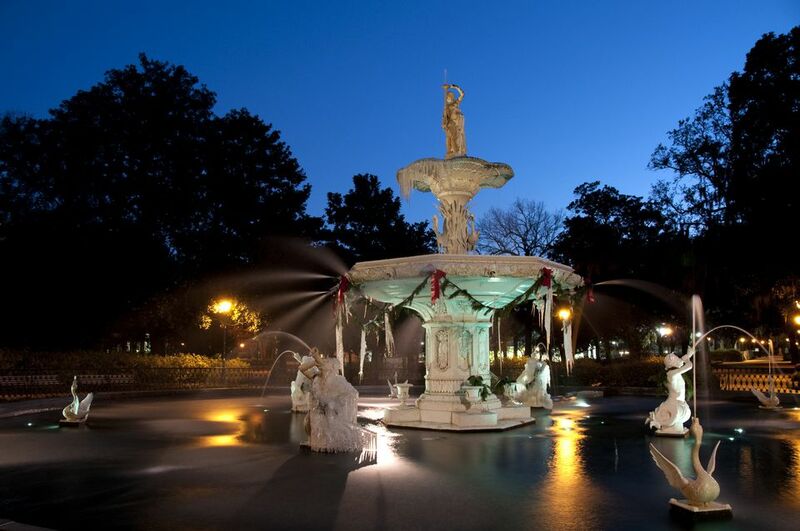 Welcome the New Year in one of the South's loveliest cities. Head to City Market for a free outdoor street party with live music. Or, plan a New Year's Eve getaway at the Westin Gourmet Dinner and/or Celebration.